Ice fishing for pike is a favorite pastime for many of us and one of our best baits is frozen smelt. In fact, for years that’s all I used. However, when you look at smelt in a package they are super boring. They look like a can of tuna fish. To me they have no life, but if you throw color on them they stand out. It’s like putting jewelry on a girl. It blings. It sparkles. It shines instead of being bland and blah. When it comes to pike fishing we’ve always thought the more color something had the more a pike would be attracted to it. They are like cats. They head towards stuff that’s different looking. If something looks different they come in right away to look. I think that’s why colors you wouldn’t expect to be good choices, like purple, has been working well. They aren’t use to seeing it and are curious. The local bait shop sells brined smelt as do many tackle shops in areas pike are found, but they use food coloring and it’s not very colorful. It’s still kind of dull to me. So last season I saw Fire Brine in a store (and with no connection to Pautzke) I decided to try it to see if it would work better than food coloring. We bought four bottles and noticed a huge difference. In about 10 minutes brining it looked better than what we’d been using before. A lot better. The first day we went out with the Fire Brine smelt the pike went crazy. They’d never seen anything else like it. We started constantly catching fish and had to buy more bait and more brine. Word got out quick and now lots of people are using the brine. In fact, this season everything we’ve dropped down a hole is brined bait. I don’t even have any plain smelt in my fridge. Everything is brined because it works so much better. Last season I caught my largest pike ever on a blue Fire Brine smelt. It stretched 49 inches and almost 31 pounds. This season I’ve already brined more than 70 pounds of smelt and need to do more soon because we are getting bit so often that the bait is going quickly. What I normally do is take a bag of every color with me when I first go out. That’s purple, red, green, orange, blue, pink and chartreuse. I can use six lines so I use a different color on each. It’s interesting, but every day a different color works better. Some days they only want pink and then chartreuse or purple is better. It’s all about variety. They like to see something different. I read an article that blue shows up best in low light and we’ve found that blue and purple work best in the darker water or water with a lot of structure that creates a dark bottom. In the shallow holes the pink and the chartreuse are the best. You’d think it’d be the opposite. There isn’t a color that hasn’t worked for us, but I never use the natural because I want the color on the fish. On the other hand, my husband likes the natural look better, so for guys that want to go with the old standby the natural will work to keep your bait durable and help it last longer. I think the brine keeps the structure of the smelt better. What we’ve noticed over the last two winters is our bait literally lasts all day. The bait will last until the pike hammers it. The brine does a great job at keeping it together. If you’ve used frozen smelt (or any baitfish) that hasn’t been brined you know this isn’t the case. Thaw smelt. I think they take the color better when thawed. I put six smelt in a small Ziploc bag and then pour the brine in. 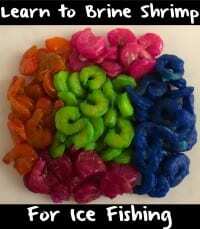 If you want to add more color and makes your baits really stand out add a little Fire Dye to the brine. It only takes three tiny drops to make it vibrant. I can do 60 smelt with one bottle of brine this way (that’s 10 bags of six). Honestly, I always use the dye in my brine now. And, use gloves. If not, you’ll look like Rainbow Brite afterwards. 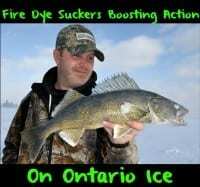 And, of course, you want to keep your oils off the fish, but most anglers know that. I might leave them out for maybe 30 minutes before putting them in the freezer flat. I want them to freeze in the juice because I think they hold up the natural pattern and absorb the color better. Also, I’ve never had freezer burn on them because I’m freezing them in the brine. In fact, they’ll last a year this way. Keep in mind, smelt goes bad in the box. After about a year they’ll start to dry up like meat does. I think you could keep this smelt for years in your freezer and when you thaw them out they’ll look like you just did them today. Nevertheless, it does take longer to get them to freeze because of the salt content in the brine. Meanwhile, this helps when you get on the water because the salt that’s saturated in the meat keeps the bait from freezing when you drop it down the hole. I can leave my bait bucket sitting on the lake, even if it’s below zero, and I’ll come back and it wont freeze. I can probably leave them out two days before that bait wants to start to freeze. Brining and coloring smelt (or other baitfish) for pike is a pretty simple process. And, it works right away. I hear some guys let it sit for a day, but these photos I’ve taken here are of smelt that was brined in fewer than 30 minutes. Editor’s Note: Kim Anthony resides in Central Montana and fishes daily with Fire Brine smelt for pike, walleye and other species. For more information please visit https://www.facebook.com/icefishingmontana/info.